Memorial Day weekend doesn’t conjure up images of sweatpants and slippers, does it? Unless you live in New Jersey. This past weekend, when most are wearing swimsuits and running through sprinklers, we were huddled up around a fire and burning pumpkin spice candles. Crazy. And with sweatpants, comes banana bread. It’s like an unspoken rule or something. I wanted to switch things up from my usual Chocolate Chip Banana Bread Recipe, and decided on this Brown Sugar Banana Bread! It’s a major win in the banana bread world! You’ve got flour, baking soda salt and of course brown sugar. Next up get you some old-ish bananas. And peel them from the bottom, I swear…apparently the monkeys eat them this way, and really, who am I to argue? When you bread is done and cooled off a bit, go ahead and make your glaze. It’s so good you’ll want to stick your face up in there and motorboat it. Pour that on your bread and you’re finito! And of course you can slather some butter all up on there. I mean, really. 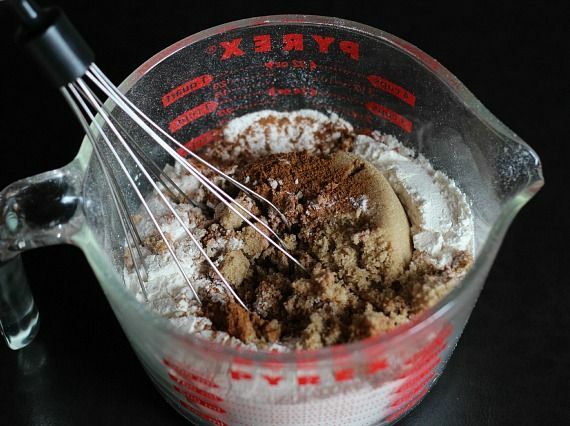 In large mixing bowl, whisk together flour, brown sugar, baking soda, salt and cinnamon. 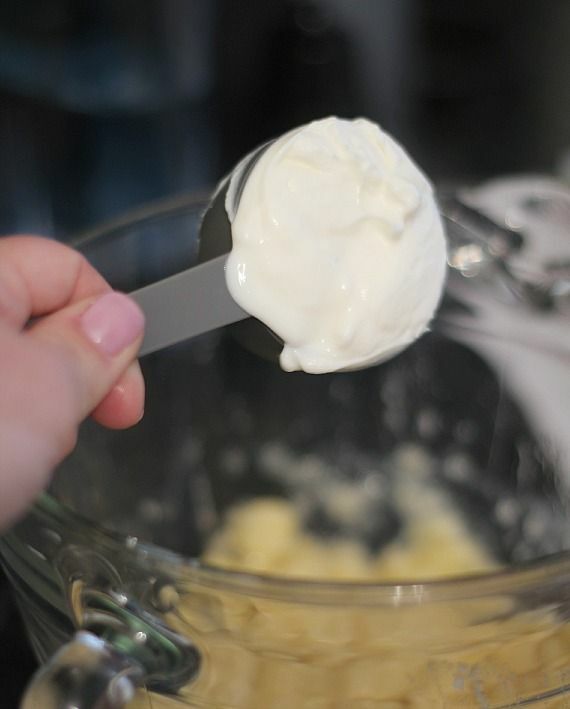 In another bowl mix together mashed banana, sour cream, eggs, melted butter and vanilla. 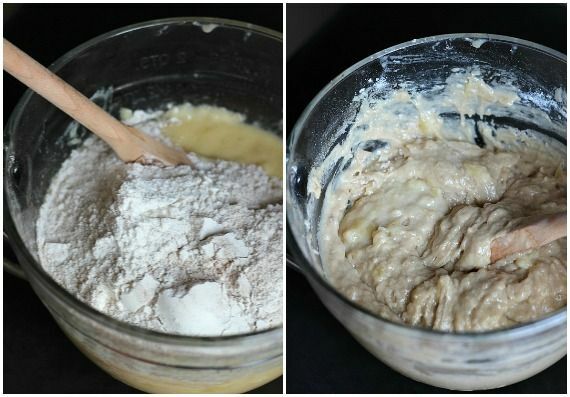 Fold dry ingredients into wet ingredients until just combined. Pour batter into prepared pan and bake for 45-50 minutes until toothpick comes out clean. Allow to cool in pan for 10 minutes. Run knife around the edges of pan to release any parts that might be sticking and then remove from pan, transferring t o a wire rack to cool. In small sauce pan, combine all ingredients, heat over medium until mixture reaches a full boil. Boil for 2 minutes and then remove from heat. 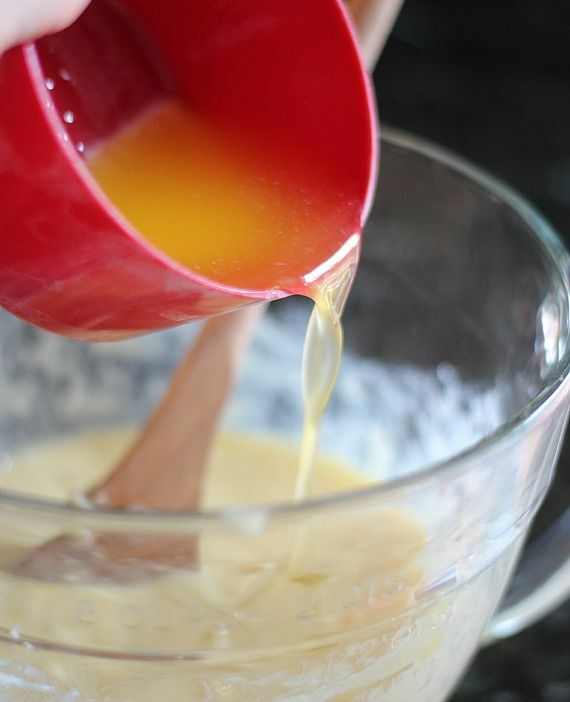 Let mixture cool for 5-10 minutes and then pour over banana bread. Glaze will set up and then cut into slices. Absolutely GORG!! I LOVE that cookbook but have yet to bake anything from it yet. It took me about 15 tries to figure out what sahn mahhh uppp meant. Probably because my brain exploded when I saw that glaze. I just started using brown sugar in my banana bread and it makes all the difference in the texture. I will never go back. Oh and glazing banana bread? You should probably run for President . I need banana bread! And I need it to not be naked! WHY AREN’T THERE BANANAS IN THE HOUSE? Sigh. Sorry to hear about the bad weather! Oh well, at least you had banana bread! Really it is stunning and that glaze!! Holy moly, hold the phone! I need a slice! Plus, banana bread is my favorite and anything with brown sugar is always delicious! I need to bake banana bread just to have this glaze. Why 2 1/2 TBSP of butter? ? Just go for 3. I’ve seen that recipe in the Back in the Day cookbook (love that book!!) and now I want to try it! I have a banana bread recipe on Wednesday I’m posting…but…you can never have too many banana bread recipes, right! Your bread looks great and the GLAZE. That is soooo perfect! Yeah I would really like to know when the weather in Jersey will start to have some sort of consistency, of the warm kind. But I guess it’s okay if it brings out recipes like this. I have never tried banana bread with a glaze…can’t wait to taste what I’m missing out on! Sweatpants and banana bread = best combo ever. I think my weekend plans this coming weekend are going to involve sweatpants and this banana bread, no matter what the weather. Looks amaaaazing! That glaze?? Yikes. Love that drizzle on top! Cool idea! I’ll be in NJ next week. You’re telling me I have to bring a jacket? That stinks. I thought I was escaping the cold! And I love the sound of this bread! I’ve never made banana bread with a glaze like that. A dirty shame, it is. I love everything banana bread and this glace looks incredible! I’m making this today on a rainy day in NJ! LOL! As well as your “nutter butter” cookies. I’m off today and it seems fitting to do what I love. My co-worker made the nutter butter cookies after I reposted your post and she made them, now I HAVE to make them! But this bread looks amazing! Can’t wait!! 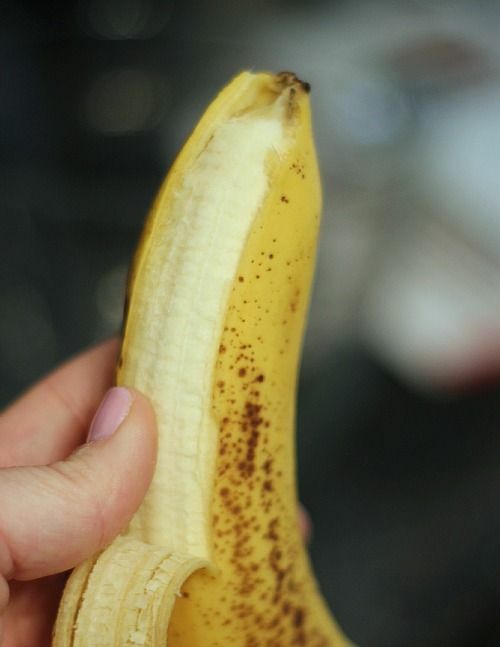 I’ll never eat naked banana bread again. This is one fantastic looking banana bread. I love that there’s Greek yogurt in it, as well. 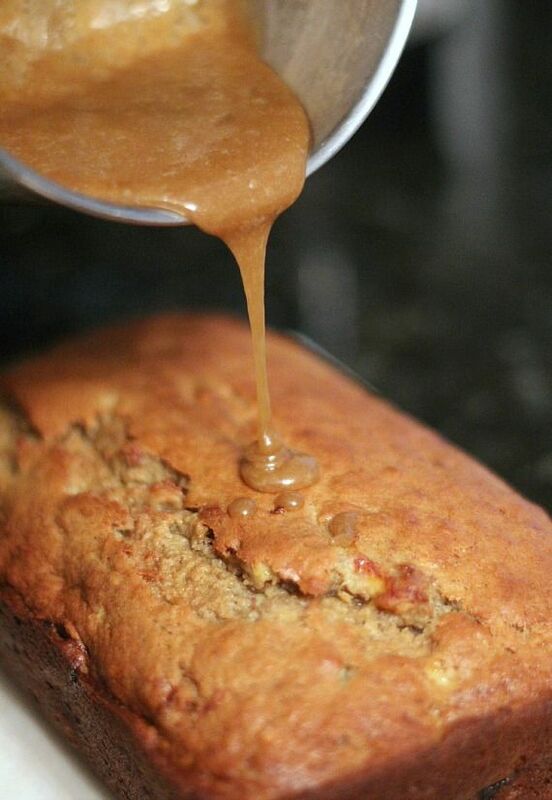 I’ve never had banana bread with a glaze, so this I’ve got to try! I layed ripe banana’s out on the counter last night so I could remember to make something divine with them….you just did all the brain work for me! This recipe is PERFECT timing! I love all things brown sugar, too! Yum! It was cold in my neck of the woods as well. I should have made banana bread, then at least my house would have smelled good. Actually I don’t think I’ve ever posted a glaze-less banana bread! What would be the point of that?! This brown sugar glaze is my life. Now, that’s a banana bread I haven’t tried… and, I agree… why DON’T we glaze banana bread? It’s a great idea! I have a 3 frozen banana’s and now I have something to make! This looks DELISH!!! I am going to the store now to get bananas! I love using brown sugar in banana bread. 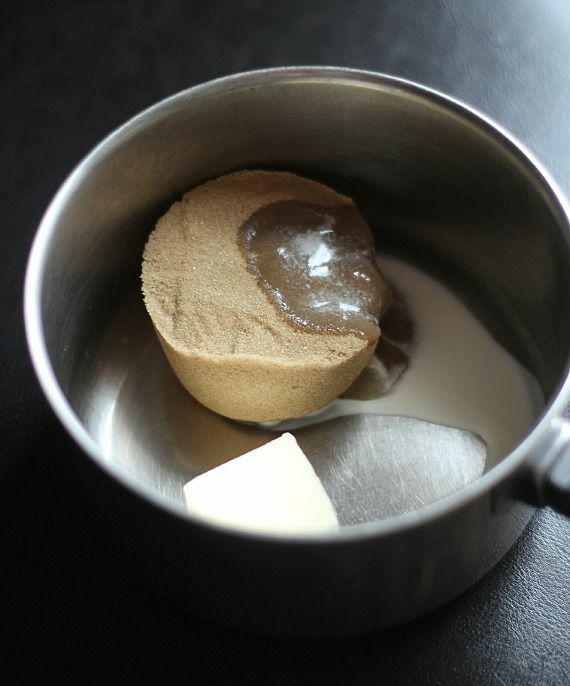 Actually, I just love using brown sugar. Your bread looks just lovely and I am so with you on the glaze. Just sign me up for anything having to do with brown sugar! This looks pretty delicious. This bread sounds incredible! How good does that glaze look?! Brown sugar makes everything better, doesn’t it? I love brown sugar, I just want to dive head first into this glaze! I’m thinking this is good for sweatpants or no sweatpants days. Uh huh. I have all the ingredients and can’t wait to try this one out! Took me a bit to translate Sahn Maa Uuupppp! 🙂 But yes, brown sugar and bananas…nummy! oh I bet this is SO moist and amazing Shelly!! This is so crazy…I just made a banana bread on Monday! Yummy! Banana bread is so yummy and your glaze is to die for! Definitely need to make this! Made this last night and it was incredible! I also added some toffee chips into the batter. It was a huge hit this morning. This looks awesome! 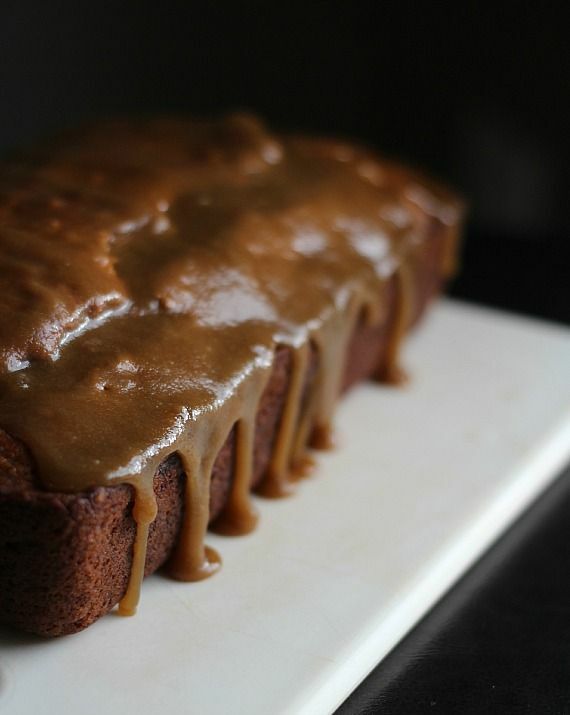 As if banana bread isn’t yummy enough, you went and added a delectable glaze! I just made this amazing banana bread (using vanilla greek yogurt) and heard “this is the best banana bread I’ve ever had” Thanks Shelly for your amazing recipe, it will def be my go-to banana bread recipe from now on! I found this recipe by searching brown sugar banana bread, since I had a surplus of bananas and only brown sugar in the house. I’m so glad I did, because this is the best banana bread I’ve ever had! I didn’t even use the glaze–but I made up for that glaring oversight by slathering it in butter. Thanks for a great recipe! Could this be baked in mini loaf pans? Made this great recipe and put dates and a bit of spice & pineapple …. Pecans would be nice too ! As for the glaze super yummy…..
O My, you had me on Brown Sugar, Mama. Can’t wait to make this!! Just made these in mini loaf pans, doubled the recipe. My only question is, do these freeze well with the glaze on? They will taste fine, but the glaze when thawed will be sticky, as opposed to a crusty glaze.